At BaselWorld 2014 Rado is presenting another first in the watch industry combined with a new material. The HyperChrome Touch Dual Timer is the first ceramic touch watch with two time zones. It displays one on the main dial and the second on a smaller one at 6 o’clock. The magic of touch lets you change the time with just the sweep of a finger or even swap the time zones and watch the hours and minutes fly by. This year Rado also introduces brand new grey high-tech ceramic. This material has the same properties as black or white high-tech ceramic but in a cool grey colour which is difficult to reproduce consistently. 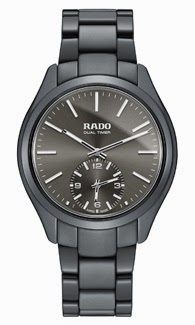 But thanks to Rado’s high-tech ceramic know-how they have achieved to recreate only one shade of grey.